The Trump administration’s just-released National Security Strategy (NSS) is, unsurprisingly, the least credible document in the history of US foreign policy-making. Its words are a poor match with US actions since January. They also bear little resemblance to the speech Trump gave for the rollout of the NSS itself, which emphasised nativist tropes about America as a victim on the world stage. Pundits anticipated as much even before the NSS was released, and they were right. But just because what the document says cannot be taken at face value does not mean the document is devoid of worth. America’s new NSS reveals much to those who might look to it for meaning rather than guidance or expectations of policies to come. The comparison of Trump’s NSS with his predecessors reveals a good deal of rhetorical continuity in US strategy. 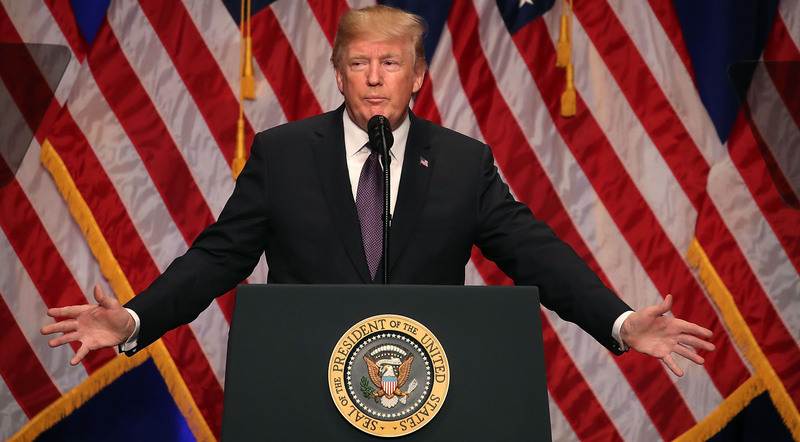 The four overarching interests of Trump’s NSS - protecting the homeland, promoting American prosperity, preserving peace through strength, and advancing American influence - are familiar. As much as Trump and Obama are a study in contrasts, even Obama’s NSS embraced these same interests, though perhaps with different degrees of emphasis. Also like past versions, the new NSS touts the importance of allies for US security and maintaining a balance of power in key regions. Such emphasis echoes the statements of the Bush era if not the Obama era. Trump’s NSS also characterises threats in ways that are familiar. Revisionist great powers (which includes China and Russia), ‘rogue states’, and terrorism would be characterised similarly by any other US president facing the present moment. There is, moreover, some comfort in the lip-service paid to the ‘rule of law’, the American Bill of Rights, and women’s equality. The document is not, as some pundits warned in advance of the NSS’s release, devoid of American values. None of this is credible, of course – the administration’s words and deeds elsewhere are quite distant from the language of the NSS document. But areas of rhetorical continuity are important placeholders for 'establishment' policy entrepreneurs in the administration who would curb Trump’s nativist excesses. Areas of continuity also sharpen the significance attached to rhetorical change. The NSS nevertheless displays many divergences from those of the past. It references sovereignty 23 times, national borders 23 times, and reciprocity (code for maximum rent-seeking from the rest of the world) 15 times. No statement of strategy since before the Cold War has been so inward-looking; William Howard Taft would be proud. It marginalises non-traditional security issues such as human rights preservation and climate change. And it reduces the value of international institutions and multilateralism to little more than sites of competition between states – a perspective that isn’t wrong but is myopically incomplete. These shifts should come as no surprise; they’re entirely consistent with, and even a codification of, the nativist worldview that Trump brought into office. The only way to explain the dissonance between Trump’s NSS rollout speech and the NSS document itself is the clash within the Trump administration between competing nativist and internationalist ideologies. Whereas pragmatists and staunch internationalists controlled the drafting of the NSS document, nobody controls Trump. Based on his speeches and tweets, Trump is thoroughly nativist in his view of the world, but most of his staff in the White House and the National Security Council are more pragmatic and have gone to great lengths to marginalise the influence of nativism and the various conspiracy theories that inform its policy preferences. Prior draft versions of the NSS took a harsher, less internationalist tone than the final product. For instance, The Atlantic reported that the NSS would include language repudiating ‘globalism and multilateralism’ as ‘hurting US and global growth’. Yet statements like these do not appear in the final document. Such absences can only be read as a victory (however modest and reversible) for American internationalism. Across-the-board competition with China is the new Washington consensus. The NSS does not abandon cooperative ties with China where its interests align (it literally says ‘Although the United States seeks to continue to cooperate with China…’). But it moves away from the false cooperative-competitive equivalency of past US administrations and embraces the latter as a reality that has been thrust upon America. China has become an issue where traditional neoconservatives (focused on great power competition), liberal internationalists (concerned with order preservation), and nativists (obsessed with blunting China’s economic prowess) all find common cause. Competition with China is here to stay. Not surprisingly, the NSS is declarative in its emphasis that China’s illiberal influence must be resisted and countered, in Western democracies, in cyberspace, in the global commons, and in international institutions. As the saying goes, even a broken watch is right twice per day. The NSS is right to claim that great power competition has returned. It’s right to be sceptical that ‘engagement with rivals’ can transform them into benign actors (a barb aimed at Obama that applies equally to Trump’s bizarre courtship of Russia's Vladimir Putin). And it’s right to emphasise that economic prosperity (nationally and globally) underwrites American power. But the NSS also represents a larger problem with the Trump administration – a continuously renegotiated bargain between neoconservative hawks and America-First nativists. The former craft US strategy, but they’re forced to do so within the constraints of Trump’s own nativist language. The result is an overreliance on military power, an attempt to belligerently extract greater contributions from friends on whom the US depends, and a failure to recognise the positive-sum potential of international institutions and multilateralism.